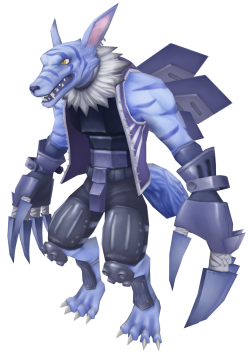 WereGarurumon X is an altered version of WereGarurumon that carries the X-Antibody Factor : WereGarurumon in its Digicore. Garuru Kick. Pitch Black attribute 3 seconds cooldown 24 DS consumed 2 skill points per upgrade Learned at Lv. Thrusts a powerful kick at the opponent. Kaiser Nail. Pitch Black attribute 9 seconds cooldown 84 DS consumed 3 skill points per upgrade Learned at Lv. Slashes the opponent with its claws.